A favorite toy among Russian children, the matryoshka doll is a series of wooden dolls that nest inside each other and get progressively smaller and smaller. Open up the largest doll and you’ll find a smaller, identical doll. Open up that doll and there is yet a smaller one. There may be as many as 15 dolls inside the largest one. The matryoshka doll can teach us some important lessons on how good leaders build a great team and how insecure or uninformed leaders can inhibit the growth and health of their organization by choosing weak team members. Recruit people who are “bigger” than you are. If the person at the top of the organization intentionally hires someone who is “smaller” (less qualified with less potential), and that person recruits someone who is “smaller” than herself and this selection criterion continues to cascade down through the entire organization, eventually it will produce a dumbed-down organization. Recruit people who are “different” than you are. 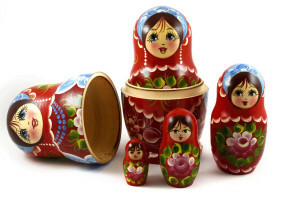 All of the dolls inside a matryoshka doll are identical (except for their size). If a leader only recruits people who are similar to himself—same personality, gifts, age range, perspective—his team will not benefit from the critical element of diversity. Choosing quality team members is the leaders most important job. For a leader, important decisions fall into two categories: strategy and people. I think the people decisions are the most important because if you get the right people on your team, they will help you set the right strategy. When I was a kid, we often played an impromptu game of softball or basketball after school. Everyone who wanted to play gathered, two captains were chosen, a coin toss determined which captain chose first, and then teammates were selected one at a time. The captain who chose the best players, won. Sometimes a captain would choose a less-skilled player early in the selection process so as not to hurt the person’s feelings (no one wanted to be chosen last). While that might have been the kind thing to do, it wasn’t the smart thing to do if you wanted to win. Leaders, choose the best and the brightest to serve on your team and your organization will prosper. This suggestion is not for the insecure and paranoid; it takes a lot of emotional fortitude and self-confidence to recruit and empower people who are smarter, more competent, edgier, and more connected than you. But if you don’t, you and your organization will suffer from the diminishing-expertise syndrome. You may wonder, “Won’t that make me look bad?” No, it will make you look like a competent leader. Remember, leaders get work done through other people. Also, surrounding yourself with top-flight people will motivate you to continue to grow and become better yourself. What? – When insecure leaders recruit team members who are less competent than they are, the team suffers. If this mentality is systemic, it will negatively impact the organization. So what? – Leaders must recruit the brightest and the best, even if the candidates are better than the leader. Now what? – When given the opportunity to choose team members, choose the best. Leaders – Analyze yourself in this area. Are you guilty of the diminishing-expertise syndrome? If so, adjust your mentality.